The wind woke me up. As I lay in the lumpy bed of the cheap motel cottage, I could hear the palm fronds slapping the window and the persistent whistle of a steady 18-knot wind. Through the slats of the jalousie blinds, I could see whitecaps marching shoreward on the Atlantic. It promised to be a rough day of diving. Welcome to the Florida Keys, a place I’d dived often over the years, and where windy conditions were familiar but never welcome. The Keys dangle like a necklace of small islands off the southern tip of the continental US, with the Gulf of Mexico on its protected northern side and the Atlantic to the south and east. The name, “Keys,” is an anglicisation of cayo, a Spanish word for “small island.” This series of coral bumps has long been a bastion for misfits and adventurers escaping from the American mainland to write novels, ply the waters for game fish or search for sunken treasure. They have also been a hub of scuba diving since the earliest days of the sport. Between the low-slung motels and souvenir shops that line Highway 1 are dozens of marinas and shops with the telltale red and white dive flag flapping in the ubiquitous offshore breeze. Conch Republic is one such dive shop and its 46-foot boat, Republic Diver, is moored in a marina on the leeward side of Islamorada. I handed my gear to the captain and stepped aboard for what promised to be a choppy ride out to Molasses Reef. Despite the long journey straight into that stiff wind, I opted to kit up before we passed the breakwater. A pitching boat is a great way to smash a finger, damage gear, or lose a wristwatch overboard and that’s the last thing I wanted to do, especially since I was wearing the new Bell & Ross BR 03-92 Diver. After testing my air supply and stowing my mask and fins, I contorted into my wetsuit and strapped the watch over my sleeve just as the big diesels revved up to plow into the five-foot seas. The BR 03-92 Diver was introduced in March at Baselworld, an entirely new watch but so familiar is its form that it seems like it has always existed. 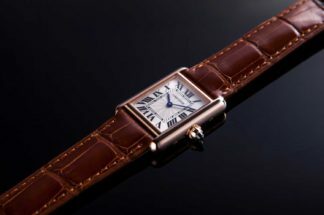 Bell & Ross may be a young company by watch industry standards, only founded in 1992, but it already has an impressive lineage of unique diving watches in its history. Whether by design or coincidence, the releases of its new divers happen in ten-year intervals. In 1997 came the first versions, the Type Marine and the Hydromax. While the former was a sleek but fairly conventional 300m diving watch, the Hydromax boasted a ludicrous 11,000m depth rating, thanks to its innovative oil-filled case. 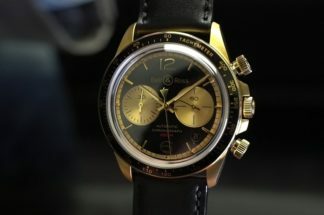 A decade later saw the introduction of the BR02-92 (and -94, a chronograph), a tonneau-shaped diver with internal rotating timing ring and bold legible dial. And now, in 2017, Bell & Ross’s subaquatic watch finally embraces the square case aesthetic by which its aviation-themed watches have become modern classics. While the earlier Bell & Ross divers were handsome and capable watches in their own right, the BR 03-92 Diver feels like the ultimate expression of the form for the design-driven brand. It also happens to be a sea creature of the rarest order – the square dive watch. 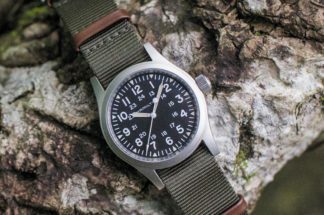 Traditionally dive watches have been round or barrel-shaped — right angle corners are difficult to seal with conventional rubber gaskets, so few, if any, have taken on a square shape. Whether Bell & Ross finally found the secret to sealing a square watch worthy of the abyss is unknown, but its 300m water-resistance is respectable and indeed at the extreme limit of humans using self-contained underwater breathing apparatus (SCUBA). Anything deeper requires surface-supplied mixed breathing gas and a hyperbaric diving bell. In other words, the BR 03-92 Diver was a perfect choice for the Florida Keys. After an initial shakedown dive on Fire Coral Hole, a shallow site on Molasses Reef, the Republic Diver motored further out to sea towards a deeper site known as Conch Wall, which is bathed in a swift current. Given the dodgy surface conditions, which whipped up silt on the shallower reef, we opted for a “drift dive.” Rather than kick around a smaller dive site, we would drop down to 75 feet and let the current carry us, a one-way ride on a Gulf Stream conveyor belt. Drift dives have their advantages. You can cover a lot of territory without breathing a lot of air, since there’s virtually no kicking required. The danger, of course, is there’s no turning back. It’s vital for a dive group to stick close together since getting separated can put huge distances between divers. Also, the dive boat must follow your exhaled bubbles on the surface in order to pick you up at the end of the dive. If the captain lost track of us, our next port of call might be Cuba. Or Africa. With a fresh tank of air reading 3,000 pounds per square inch, I waddled to the dive boat’s transom, gave the bezel of the BR03 a spin to align the zero mark with the large minute hand, and stepped into the sea. Lest we overshoot the reef below, we deflated our buoyancy vests and descended quickly, equalising our ears as we dropped. The reef came into view, a riot of hard and soft corals, populated by schools of jacks, snapper and the odd nurse shark or barracuda. As we drifted along, my exhaled bubbles trailed behind me, a sign of how fast the current was here. I cruised over a crack in the reef and spied a stingray half-buried in the sand below. Attempting to get a closer look, I turned and tried to swim against the current to slow my progress but it was no use. This dive was strictly fast forward. A glance at the Bell & Ross told me that we’d been down for only 12 minutes. I looked 75 feet above, my eyes searching in vain for the silhouette of the Republic Diver following us. Aside from its distinctive looks, the BR 03-92 Diver is a worthy dive instrument. Though the case shape resembles other Bell & Ross timepieces, its dial draws on decidedly subaquatic cues. Instead of the looping aviation-inspired numerals, it opts for bold circular and hashed markers, which are generously swathed in luminescent paint. The hands are long silver needles, faceted to catch light and also luminescent for reading in dark conditions. The hour hand is painted orange, distinguishing it from the minute hand, which is filled with bright white lume, at a glance. Orange is a good choice for the less necessary hand since it is one of the first colours to fade as a diver descends, relegating it to the background as the prominent minute hand counts out the dive time. 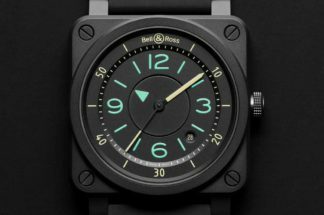 The watch’s primary feature, and the one that makes it a dive watch and differentiates it from the other instrument series pieces from Bell & Ross, is the rotating timing bezel. Sitting up off the case, the bezel is easy to grip and legible, its round shape playing off against the chunky right angles behind it. It ratchets with authority counter-clockwise and features an anodised aluminium timing ring. 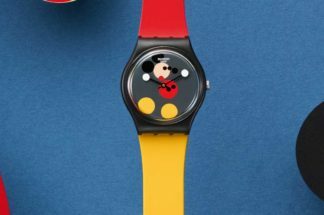 Bell & Ross was one of the brands that, in the mid-1990s, ushered in the big watch trend. The BR01 series, also square, was a whopping 46mm in both directions, a bold statement on the wrist and one that put Bell & Ross on the map. The BR03 series followed, of which the Diver is the latest and, at 43mm, is entirely more wearable. Its stubby strap lugs allow it to fit well on most wrists. Combined with the bold, textured rubber strap and worn over a wetsuit sleeve, the watch looks right at home in a dive environment, despite its original aircraft instrument panel inspirations. Ticking inside the BR03 Diver is a self-winding mechanical movement, a rugged third-party motor that Bell & Ross massages into what it calls the calibre BR-CAL.302. Decorated in-house movements are utterly superfluous in tool dive watches and this one is fittingly unadorned and hidden behind a flat engraved caseback. Its only complication is a subtle date function, which is all but invisible until you look for it while entering the day’s dive information in your logbook. I again checked my watch and now 44 minutes had elapsed. At a nearly constant drift at 75 feet, we were approaching my no-decompression limit so we started slowly ascending to the surface. The sea floor below faded to a moonscape, and with our rapid drift, gave the impression of a spacewalk, the Earth below seemingly rotating beneath me at 17,000 miles per hour. A school of toothy barracuda hung above, just below the surface. We drifted past and I wondered how they were able to stay so still in a strong current without so much as a flick of their tails. At 18 feet, our guide unfurled his surface marker buoy and puffed air into it from his regulator. It shot to the surface, attached to a line and reel in his hand. As we drifted along, suspended here between the sky above and the sea-floor far below, a sense of calm set in. While we waited for the boat to arrive, we off-gassed, a common practice known as a safety stop. My digital dive computer beeped to alert me to this, but its countdown timer doesn’t display seconds, so I spun the bezel of the BR03 Diver to track my obligatory three minutes. I watched the sweeping seconds hand, mesmerised, until I was jolted back by the reassuring rumble of the Republic Diver’s engines above. When the seconds hand counted up to three minutes, I looked around and gave the “OK” sign, before taking a last look at the disappearing reef below and ascending to the sun and waves above.